Designed with care and finesse in the Netherlands, the Technivorm Moccamaster KB741 has been refined over 50 years to extract every nuanced flavor from your fresh ground coffee. 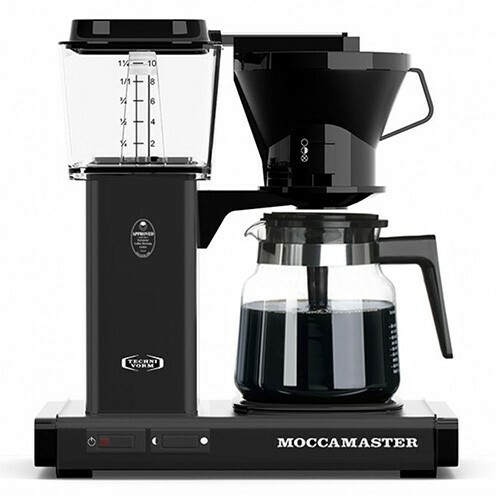 Featuring some of Technivorms' most innovative ideas including the use of a copper boiler for even heat distribution throughout the brew process; a glass carafe and warming plate with temperature control switch; and a brew through lid which protects the coffee's heat as it is transported from grinds container to carafe. In addition, the KB741 is one of the few coffee makers certified by the Specialty Coffee Association of America to brew within the optimal temperatures of 198° and 204°. With details crafted for the highest quality extraction down to the very last drop, Technivorm's KB741 will boost your coffee experience up to its highest level in taste. Gold Standard Coffee - One of the few coffee makers out there that will consistently brew at 200°F – a temperature certified by the SCAA (Specialty Coffee Association of America) to create premium flavors. Brew-Stop and Auto-Off - Easily stop the flow of coffee by closing the valve on the grinds container. Also, if you hear the machine click off, that wasn't a ghost! The KB741 automatically turns itself off after two hours. 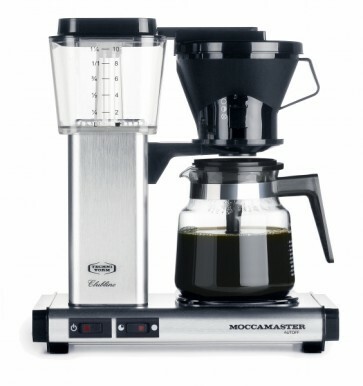 Water Level - Made in the Netherlands, the Moccamaster KB741 measures its cup sizes a little bit (1.75 oz.) smaller than the US standard cup of coffee. Hot Hot Heat - One of the few coffee makers that brews at an optimal 200°F and is certified by the SCAA (Specialty Coffee Association of America). Great Tasting Coffee - Coffee tastes 'sooooo' much better when brewed at the correct temperature, and with the right equipment! With this level of attention to detail, you can taste the difference. Sturdy Build - This is one of the most durable and best quality coffee brewers we have ever tested, clearly built to last. Industrial Design - We’ve heard it before, and we’ll hear it again: “What even is that weird pillar thing under the water tank? !” Although it may appear to be unutilized space–in truth, that’s where the copper boiler is kept. Practical application aside, many people feel that this tall pillar looks a bit out of place. The KB741 comes equipped with a long, long list of Technivorms' coolest design ideas. But not all of their models include each of these bells and whistles. For example, if you'd prefer a single serving pot–Click here to check out the Cup-One version. Crew Review: Technivorm KB741 - Redux!